It's a little hard to get a good picture of this one without actually going inside the grounds! This is what you can see from the side gate though. Anyway, Holyrood Palace is the Queen's official residence in Scotland. She normally visits for at least a week every summer, to host the Garden Party, where members of the public are invited to mingle with royalty. 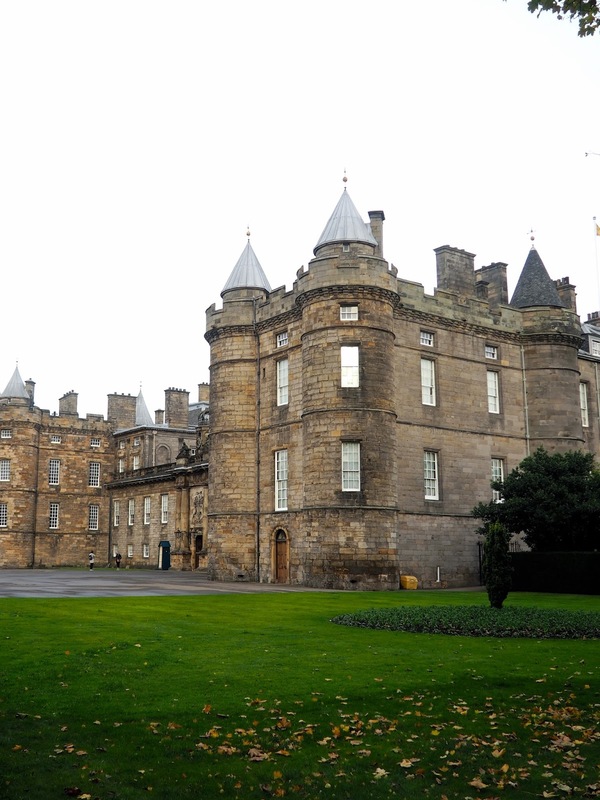 The Palace has been a royal residence since the 16th century, but there's been buildings here since at least the 12th century - next door to the Palace are the ruins of Holyrood Abbey. Visitors can see various rooms inside the Palace, with the help of an audioguide, and finish off their visit with a walk around the Abbey and the Gardens. One of the most dramatic stories from Holyrood, is that this is the location of the murder of David Rizzio, the Italian secretary to Mary Queen of Scots, whose husband Lord Darnley killed Rizzio out of jealousy. Across the road from the palace is the Scottish Parliament building. Although Scotland is part of the UK, and elects MPs to represent the country in Westminster, London, there is also a devolved Scottish Parliament, to which MSPs are elected. Scotland is able to control certain areas on its own, such as education and transport, while other affairs, like tax and foreign affairs, are controlled by Westminster. Scotland and England's parliaments were united in 1707, before devolution was voted for in a referendum in 1997. A new building was commissioned, designed by Spanish architect Enric Miralles, though he unfortunately passed away before the building was completed in 2004. The modern design was met with mixed responses from the city's residents! Along one side of the building, there are quotes about Edinburgh, the one pictured here being one of my favourites. Just behind the Parliament, with Arthur's Seat behind it, is Dynamic Earth, a popular attraction with locals and tourists alike. This is an interactive learning journey through the Earth's natural history. You travel back to the beginning of time and learn how the earth came to be, and how the various climate regions of the world function, all with plenty of hands-on exhibitions. The ShowDome is also a standout feature, showing films on a 360 degree screen. 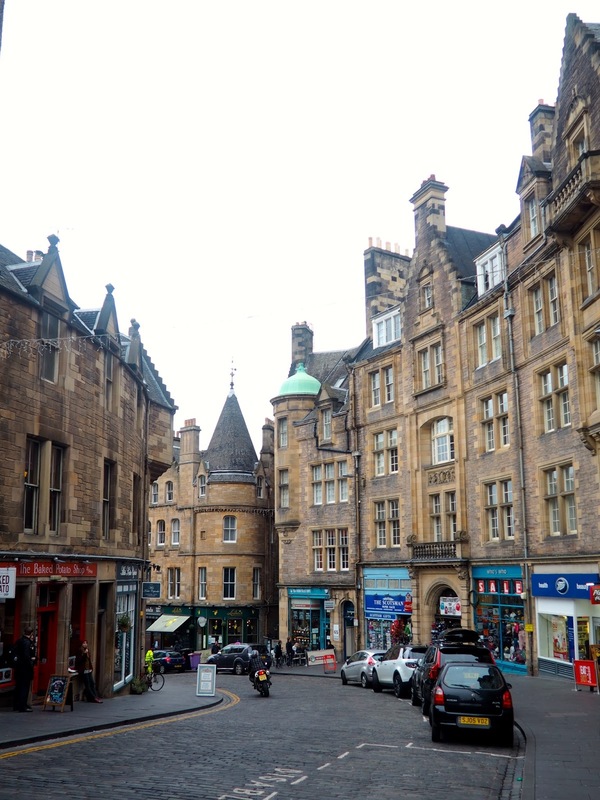 As you continue up the Royal Mile, away from these first attractions, you'll pass one of the most notable shops on the street - Ye Olde Christmas Shoppe. That's right, you can buy your Christmas wrapping and decorations at any time of year in Edinburgh! Just next to it is the Canongate Kirk (kirk is the Scots word for church by the way), which serves the Royal Family when they're in residence in Holyrood. It was built by James VII, so he could convert Holyrood Abbey into the Chapel of the Order of the Thistle (more on them later!). The statue outside is the poet Robert Fergusson, who is buried in the kirkyard, as are David Rizzio and Adam Smith (more on him in a bit too!). On the apex of the roof, you can see a crown inside a pair of antlers, which came from a real stag, shot by King George VI at Balmoral in 1949. 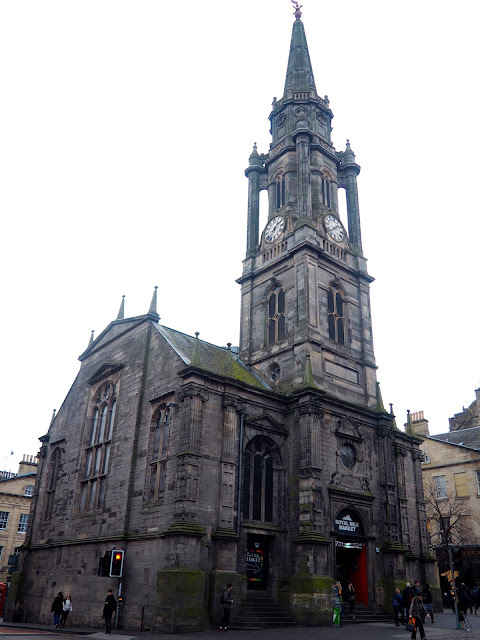 Notably in recent years, Canongate Kirk was the location of the wedding of Zara Phillips, the Queen's granddaughter. 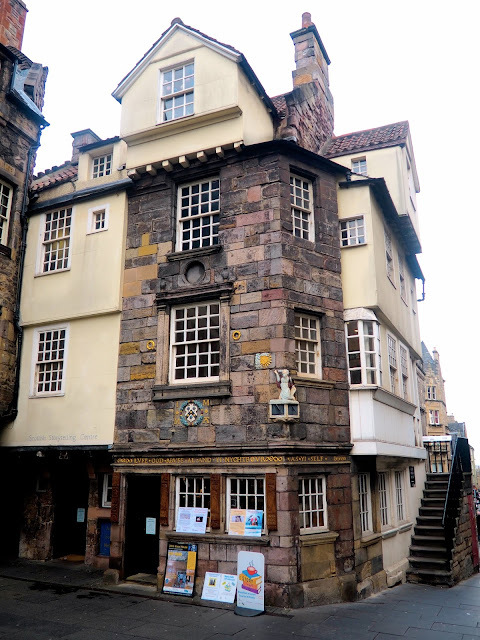 Just across the road from Canongate Kirk is the Museum of Edinburgh, a small, free museum, with a collection of artefacts and objects about the history of Edinburgh. 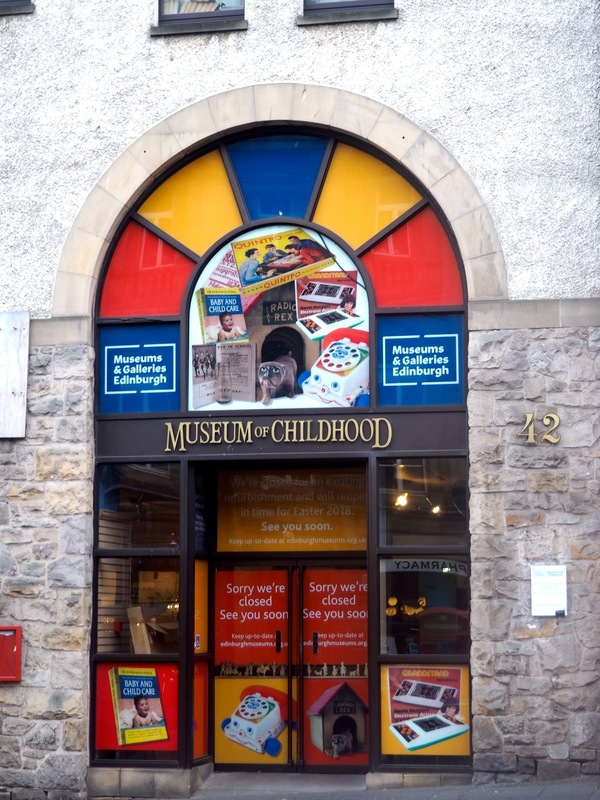 And a little further up the road is the People's Story, another free museum about the everyday folk of Edinburgh, which uses a lot of oral histories, telling the true stories of people's lives. Both are very small, and take little more than an hour to explore, but they're worth noting for visitors on a budget! The People's Story is inside the Canongate Tolbooth, formerly the location of tax collection and a jail - you can still see one of the cells inside the museum. By this point, you've completed the Abbey Strand and Canongate portions of the Mile, and have now arrived at the High Street. Edinburgh used to be surrounded by a city wall, known as the Flodden Wall after the Scots were defeated by the English at the Battle of Flodden in 1513, and forced to retreat to Edinburgh. This junction marks where the wall used to be, with brass cobbles in the road showing the location of the city gates, as Canongate was a separate burgh for a long time. No. 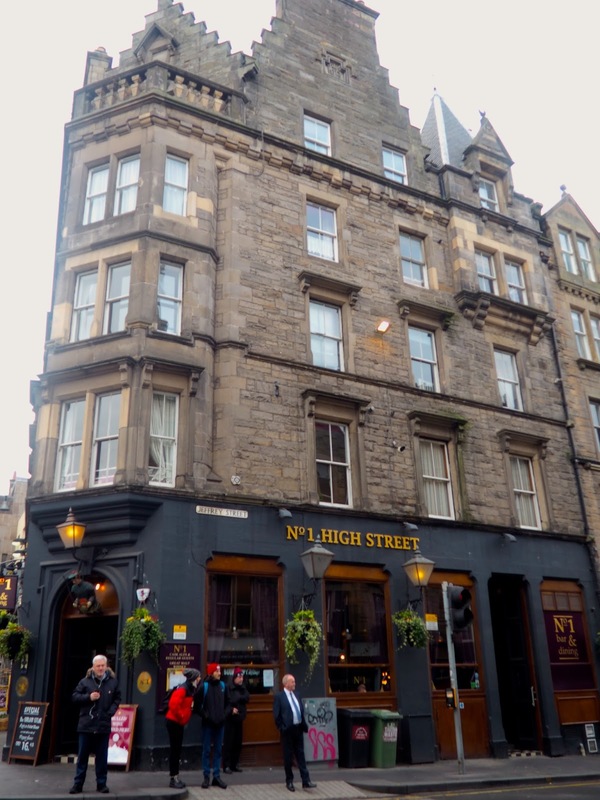 1 High Street is now a Scottish pub, and across the road you'll see another pub (not pictured) called The World's End, so named because the world beyond the city wall did not belong to the residents, and they had little interest in what was beyond the gates. Just up the street from these on the left, you'll see an old picture house sign - this was the Palace Picture House, which was a cinema in the 1930s-1950s, then converted into a dance club in the 60s, and is now a clothing shop. These two are almost the same thing, as the Scottish Storytelling Centre is inside the building that was John Knox's House. John Knox was the leader of the Scottish Reformation, stripping away the wealth and hierarchy he disapproved of in the Catholic Church, and replacing it with a strict, humble lifestyle of Presbyterianism. He was minister of St Giles (see later in the post!) for a time, and also well known for clashing strongly with Mary Queen of Scots, because she was Catholic, and also because he believed women should not be rulers. This house dates back to 1470, and Knox only lived in it briefly in the 1570s, but this gave it enough importance to save it from demolition, making it the only surviving medieval building on the Mile. Visitors can tour the museum inside, and the building now also incorporates the Storytelling Centre, which celebrates the oral tradition of storytelling, and hosts live storytelling, theatre, music, visual arts, and workshops. The Museum of Childhood is yet another small, free museum found on the Mile, which has several rooms filled with all kinds of toys and children's playthings from over the years. 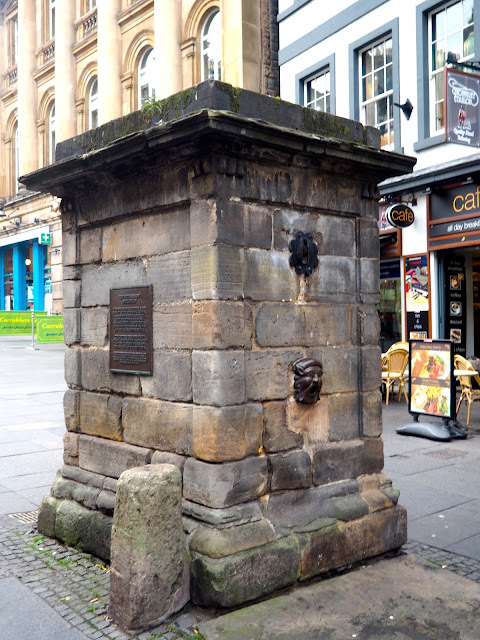 Opposite the museum, just up from the John Knox House, you'll see this stone block, which is a wellhead - there's s few more to be spotted along the Mile - which was how the city's inhabitants used to get their water. The water came from Castlehill Reservoir, fed into by springs in the Pentland Hills, but has now been decomissioned, and the Wellheads were also places for people to meet and exchange news and gossip. Continuing up the Mile, you'll come to the junction where the High Street changes into Lawnmarket, bisected by North and South Bridge. 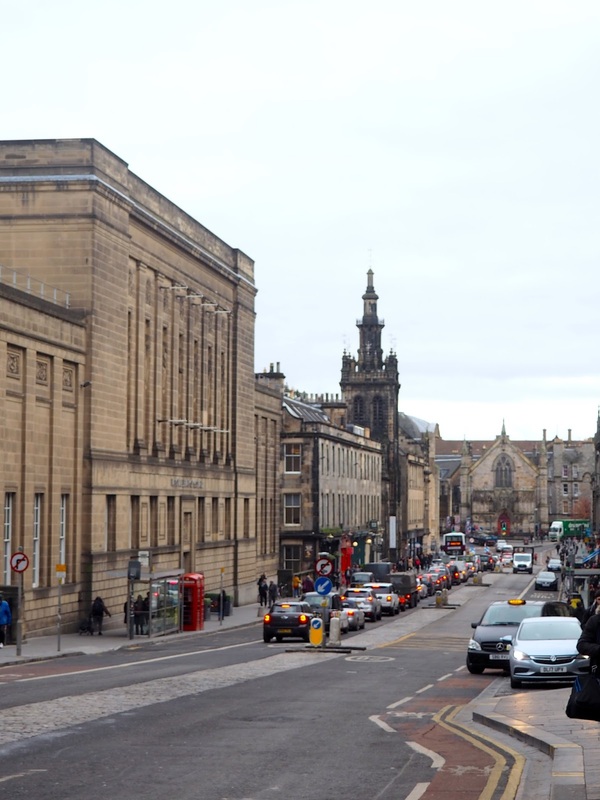 The North street is a bridge over Waverley train station, leading to Princes Street and the New Town, while the South crosses above Cowgate, and leads to the Newington area of the city. The Tron Kirk is difficult to miss, with its gothic spire, and dates from the 17th century, but hasn't served as a church since 1952. Some of Edinburgh's kirks still bear the name cathedral (like St Giles, coming up soon), a remnant of the turbulent Reformation era, but Tron Kirk was built after that time, and has always been a Protestant church. Now, it is home to a small market inside every day. Behind it, you can walk down Blair Street to reach the pubs and clubs of Cowgate, while across the road is Cockburn Street, a curving path of shops and cafes that leads down to Waverley. The Royal Mile has a couple of statues of folks deemed important, so I'd better explain who they are! 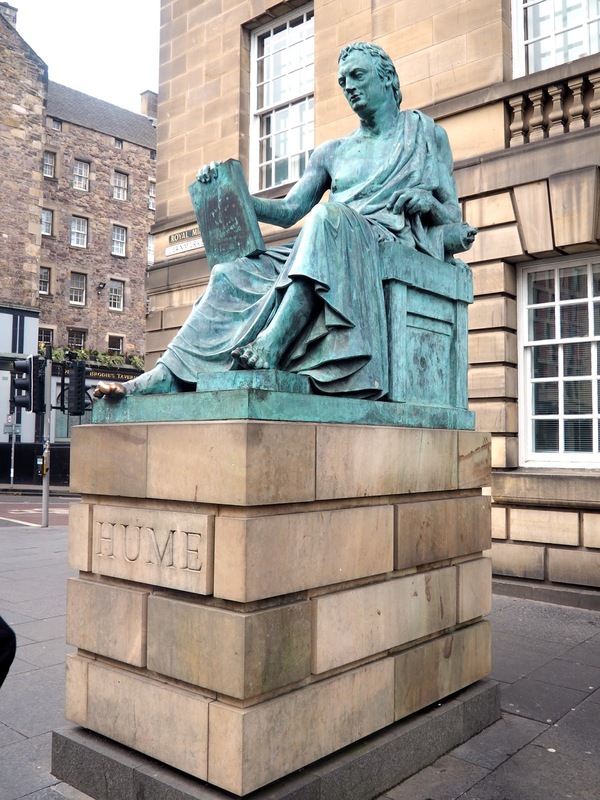 Both Adam Smith and David Hume (coming up soon) were important figures in the Enlightenment era, in the 18th century. Around this time, Edinburgh became a hub of intellectuals and artists, who were making great advancements in knowledge, technology, and the arts, as new societies were created for them, and the university's reputation grew. 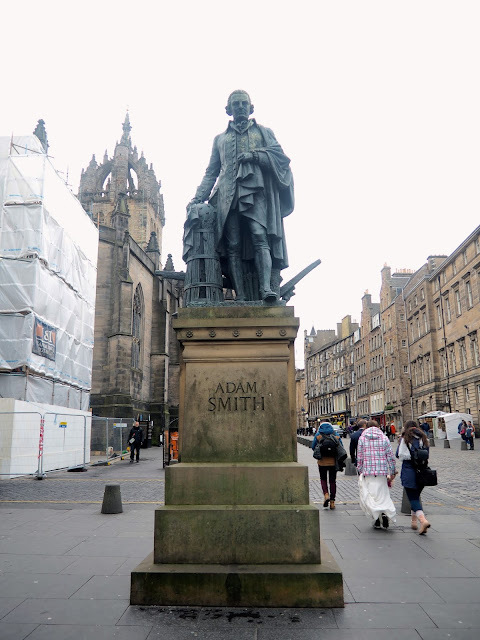 Adam Smith is considered the father of modern economics, as the principles we still use derive from his book, 'The Wealth of Nations', which laid the foundations for free markets and division of labour. On the right, opposite the Smith statue, is the City Chambers building. This is an interesting building because it's a little deceptive. 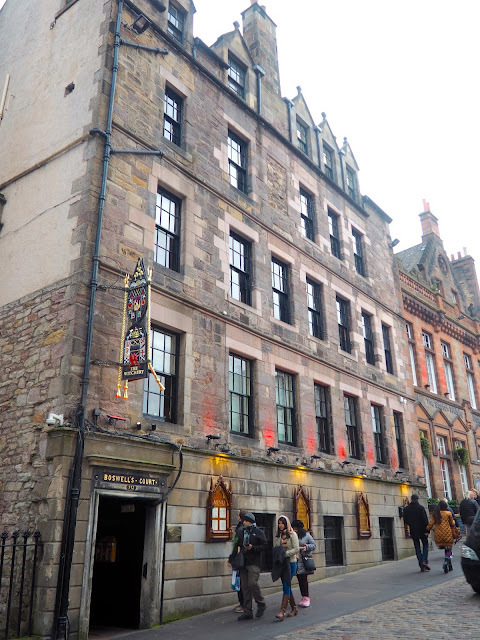 Most people would guess there are four or five floors to it, but in actual fact, because the Royal Mile is built along a volcanic ridge, the Chambers have eleven floors built into the hillside, which you can only see from the other side of the building. It was designed by John Adam in the 18th century to be The Royal Exchange, the location of merchant trading in the city, and now functions as the headquarters of the city council, though there are function rooms available to hire inside too. In the courtyard, there are inlays on the ground with the names of Edinburgh Award recipients, who are chosen for making a positive impact on the city, and earning it recognition. 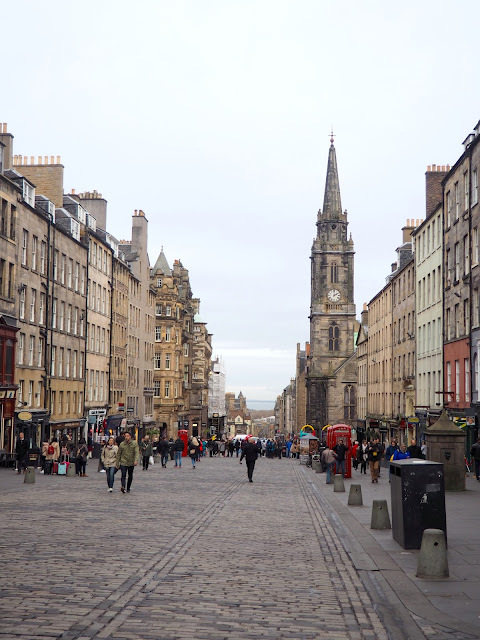 The Royal Mile has dozens of narrow alleys branching off it, known as closes, as the building were all built very close together when the city wall still existed, to accommodate its many residents. Some of theses alleys were eventually built over the top of, turning them into arches 'closed' to the sky. Mary King's Close no longer has any inhabitants, but has now become a tourist attraction to see how people used to live in the 17th century, when Edinburgh was an overcrowded, disease-ridden, filthy city - families were crammed into tiny flats, plague and cholera spread with easy, and the Great Fire destroyed hundreds of homes, as it was able to spread so quickly. 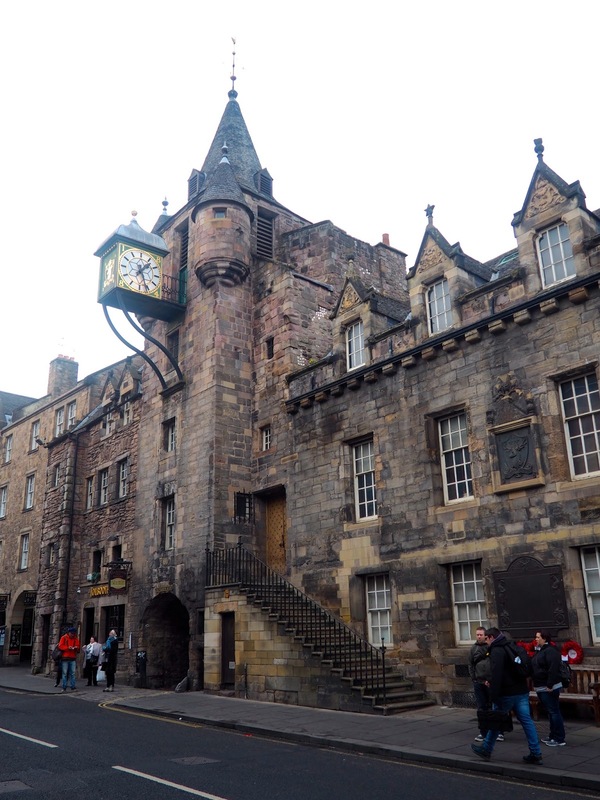 Mary King's Close also has a particularly dark history; the residents were infected with the plague and many died during the outbreak, leaving the street in a state of disrepair. 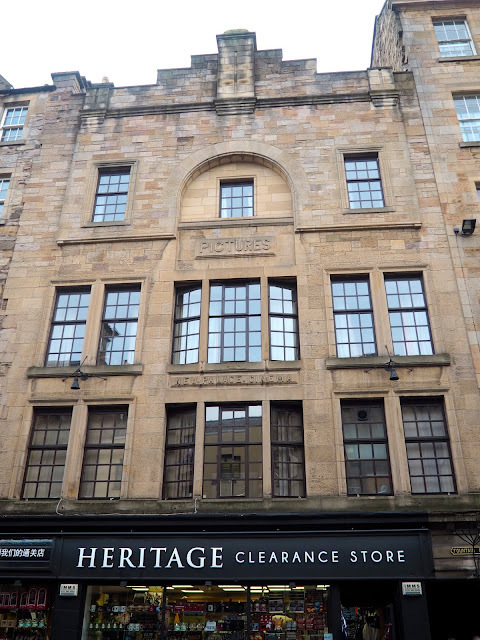 The city decided to condemn the streets, building over the top of them to form the foundations for The Royal Exchange above (now City Chambers, see above). This close ran closest to the Nor Loch too (now drained and replaced with Princes Street Gardens), where the city's sewage would run - people threw their chamberpots out the windows, accompanied by the cry 'gardyloo! ', a bastardised version of the French 'gardez l'eau'. The loch turned into a cesspool that gave off noxious, hallucinogenic gases, resulting in many stories of hauntings from the residents. One such ghost story persists though inside the close; Annie's room is filled with toys left in tribute to a little girl who was left there to die by her family and lost her doll. Her story was told by a Japanese psychic, who was gripped by a feeling of sickness, hunger, and cold in the room, and many others have told the same story over the years. 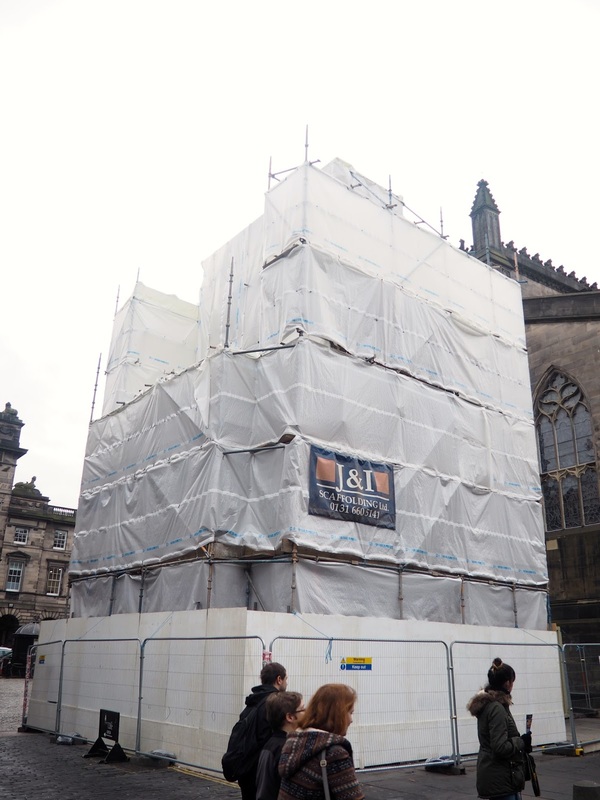 Unfortunately covered in scaffolding for renovation at the moment ( I might update this with another photo eventually! ), the Mercat (meaning market) Cross was the city's central meeting point, where locals came to market to trade and buy goods. The Cross was used as the site of royal and parliamentary proclamations, when someone would climb up it and make announcements to the city, in an era before TV and internet. After Scottish Parliament closed and moved to London with the Union in 1707, the tradition continued, but now the news came 3 days later - the time it took a horse and rider to journey from London to Edinburgh! The cross was also used to carry out punishments, as thieves in the market would be nailed to it by their ear for 24 hours. During that time, the population would yell abuse and hurl items at the thief, and the only option for escaping the punishment was to rip your own ear off! The current cross dates from 1885, but still contains a section of the original 14th century cross, and the mosaic inlay on the ground nearby marks its former location. On top of the cross, there is a unicorn, the national animal of Scotland, chosen for being a symbol of purity and chivalry, as well as being beautiful, wild, and impossible to tame - much like the Scots. The building here used to be the location of the Scottish Parliament until it was moved to London, and it now functions as the Supreme Courts of Scotland. The ground it's built on tells a more interesting story though. Parliament Square is located behind St Giles Cathedral (up next), and so used to be the kirkyard. So many bodies were buried here after the plague outbreak, that eventually they were in danger of overflowing, so the kirkyard was closed and people were then buried in Greyfriars, and some bodies were relocated there. The rest remain in unmarked graves under what is now the car park. However, the body of John Knox remains, with a plaque marking the location. He was minister of St Giles, and requested to be buried near his church, so it was deemed wrong to move him - he now lies at rest underneath parking spot no. 23. St Giles is the patron saint of Edinburgh, and this is the most important church in the city. It dates back to the 12th century, and although still called a cathedral, it is technically a High Kirk of the Church of Scotland since John Knox brought about the Reformation, and there is no longer a bishop in seat there. King Charles I tried to send bishops back to Scotland, in line with Anglican practices, but didn't inform the population of this. When the residents of Edinburgh showed up for service and were greeted by a bishop, there was some confusion, and even outrage. A woman named Jenny Geddes was so angered by his presence, she stood up and flung her stool across the church at the bishop's head! St Giles' also has a small chapel inside, called the Thistle Chapel - look out for the bagpipe playing angels inside! - the official chapel of the Order of the Thistle, an order of 16 knights chosen by the monarch. The thistle is the national flower of Scotland - although technically a weed! - supposedly chosen because hundreds of years ago, a group of Norse invaders were trying to ambush sleeping Scottish soldiers, but stood on the thistle, and their cry of pain woke the Scots and allowed them to triumph. The thistle is also wild, beautiful, and a bit prickly round the edges - much like the Scots! Right outside St Giles, you'll see a heart shape mosaic in the ground - don't step on it, to avoid looking like a tourist! Locals will walk around the heart, and occasionally spit into the centre of it - hence not wanting to step in all that spit. This is the Heart of Midlothian, which marks the location of the old Tolbooth, the tax office and jail in the city centre, which was demolished in 1817. Naturally, most people weren't keen on paying taxes or going to prison, so they would spit in disgust as they left the building, and that tradition continues on the heart today. Hearts of Midlothian are also one of Edinburgh's two major football teams, so plenty of fans of the other team, Hibernian, will spit on the symbol of their rivals. Continuing up the street, the next junction to cross the Mile leads to a couple of interesting locations. Turn to the right and you will come to the top of the Mound, which leads down to Princes Street and the National Galleries. To the left is George IV Bridge, which takes you towards the National Museum, the University, Greyfriars Kirk, or down the curving Victoria Street to Grassmarket - all excellent to visit, but not on the Mile, so I'll save them for another post. Also on the right of this junction is a statue of David Hume - remember I mentioned him earlier? Like Adam Smith, he was a prominent figure during the Enlightenment period, a philosopher known for championing reason and rationality, and challenging superstition and religion. Ironically, local superstition says rubbing his big toe will bring you knowledge and luck! Scots don't typically wear togas, given our weather, but the statue was given one because Edinburgh came to be known as the 'Athens of the North', due to its intellectual advancements, similar to those of Ancient Greece, and the New Town was designed to emulate classical cities. Across the road from David Hume, is a pub named after another of Edinburgh's notable residents, but he was known for a very different reason! 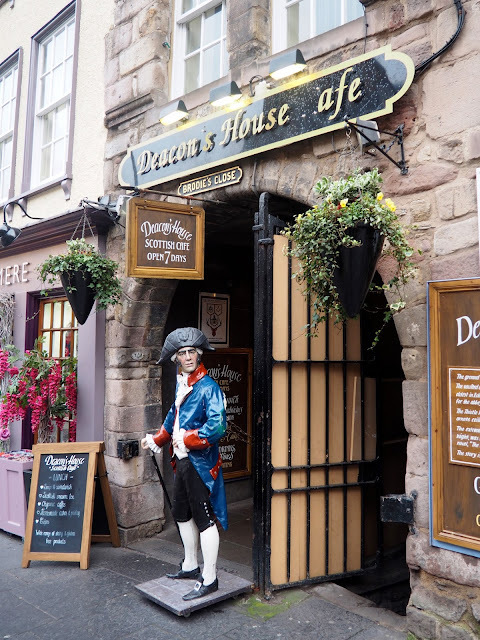 There's a cafe opposite too, with a statue outside, all named after Deacon Brodie. Brodie was a cabinet maker, locksmith, and councillor in Edinburgh, well known, liked, and trusted amongst the population, thought to be a highly reputable man. However, he secretly had two mistresses, five illegitimate children, and a serious drinking and gambling problem, all of which cost him a lot of money. He made cabinets and locks for many wealthy citizens, so he simply made copies of their keys, and would return to their homes later to steal from them. He continued doing this for over 20 years, with some accomplices, and no one could understand how the thefts were happening, with no sign of forced entry. One of his accomplices was eventually caught and Brodie fled the city, but was caught trying to board a ship to America. He was sent back to Edinburgh, where his trial was a shock to locals who had trusted him so much. He was hung outside the Tolbooth Prison, though legend says he wore an iron collar and the hangman helped him escape! This tale of a man considered good and trustworthy by day, but was wicked and dangerous by night, became the inspiration for the story 'Dr Jekyll and Mr Hyde', by Scottish writer Robert Louis Stevenson. Continue past the tavern, and turn into the next close to reach the courtyard of Lady Stair Close. This is an example of Edinburgh's chaotic architecture, with these narrow alleys and many flats crammed into each building. Lady Stair's house was the largest here, she being the wealthiest resident, but has now been converted into the Writer's Museum. 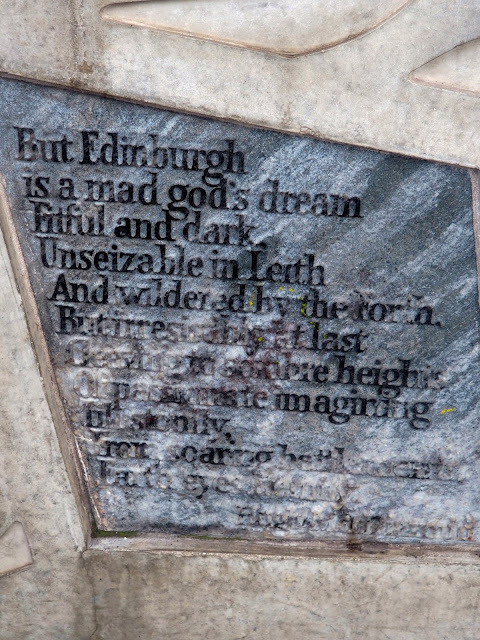 Edinburgh is a UNESCO City of Literature, the first of the Creative Cities network started in 2004, which now includes over 100 cities worldwide. Famous writers hailing from Scotland include Arthur Conan Doyle (Sherlock Holmes), J.M. Barrie (Peter Pan), Kenneth Grahame (The Wind in the Willows), Ian Rankin (Inspector Rebus series), and Irvine Welsh (Trainspotting). 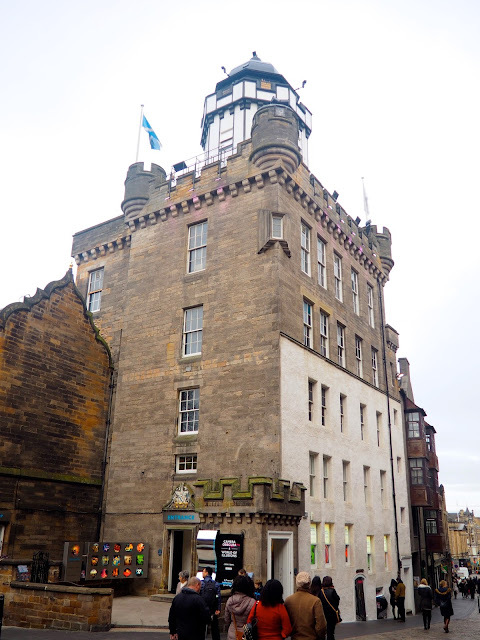 The Writers Museum features Robert Louis Stevenson, already mentioned as the author of 'Dr Jekyll and Mr Hyde' and 'Treasure Island', as well as Sir Walter Scott and Robert Burns. Scott wrote several novels in the Scots dialect, including 'Waverley', making Edinburgh's train station the only one in the world to be named after a novel, and the huge gothic spire on Princes Street is the Scott Monument, the tallest monument to a writer in the world. Burns is known as Scotland's national bard, a poet and songwriter, who was also a farmer from Ayrshire. He lived in Edinburgh for a time, where his romantic poetry made him popular with the ladies! His most famous works include 'Auld Lang Syne', 'My Love is Like a Red Red Rose', 'Tam o'Shanter' and 'Tae a Moose'. Every year on his birthday, 25th January, people attend Burns Suppers, where his poetry is recited, and we dine on haggis, neeps (turnip) and tatties (potatoes). Exit the courtyard by any of the closes and you'll come back on to the Mile, and turn right to continue uphill. 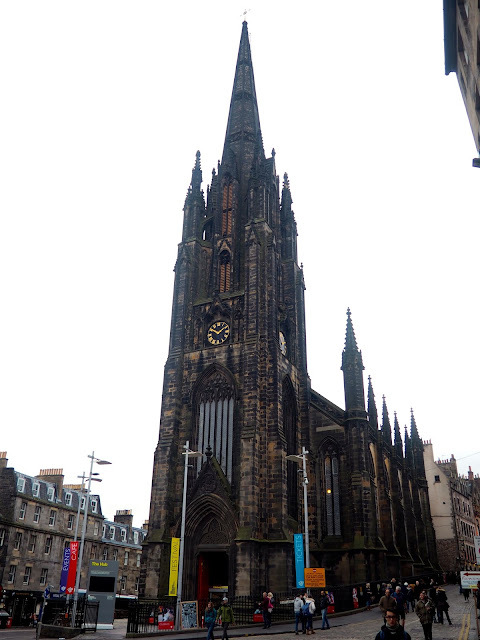 The spire of The Hub is the tallest point in Edinburgh, so it's pretty hard to miss this one! This was originally the Tolbooth Kirk, constructed in the 1840s, but went out of use in 1979 when the congregation was combined with Greyfriars Kirk nearby. The building stood empty for a time, before being renamed The Hub in 1999, and becoming the current headquarters of the Edinburgh International Festival. The Festival began in 1947, and performers of classical music, dance, opera, and theatre were invited to perform in the city. This Festival still happens every year, but it is perhaps the Festival Fringe that is the better known event - it started the same year, in retaliation to the International Festival, as many theatre companies and performers felt excluded by the 'invitation only' scheduling. The Fringe was started for anyone to take part in, and even now, anyone can register any sort of show to perform, including comedy, dance, theatre, improv, and any other weird and wacky performance people can think of! It's become the largest performing arts festival in the world, taking over hundreds of venues to host thousands of shows every summer. You've now reached the final of the five streets that make up the Mile, Castlehill - congratulations! There's a few interesting sights on this section of street, not including the almost continual presence of a bagpiper there. First, on the left, is The Witchery, one of the finest and most famous dining experiences in the city, with its opulent interior and delicious menus. It's name comes from the hundreds of witch trials that took place in Edinburgh - women would be thrown into the Nor Loch, and if they floated they were guilty of witchcraft and burned at the stake on Castlehill. If they sank, they were innocent, but unfortunately wound up drowning. Next door is the Scotch Whisky Experience, a popular tourist attraction, that takes you on an interactive journey through the whisky distilling process, teaches you about the different regional varieties of whisky, and most importantly, allows you to sample four different varieties at the end - of course, with the option to buy and sample more if you wish! Opposite these two is Camera Obscura, another popular day out. The building has several floors of optical illusion installations, which are great fun for all ages, and the roof is home to the actual camera obscura. The best way to understand what the camera is, is to see it yourself, but it's basically a dark room which has a pinhole projecting images of the surrounding city on to a large round screen in the centre of a dark room - the best part is spying on people and using paper to 'pick them up' from the screen! And at last, you've reached the top of the Royal Mile, where you will be met by the Esplanade leading to Edinburgh Castle, perched atop Castle Rock. There has been evidence of a hill fort of some form here since possibly the 2nd century, but the oldest existing building in the Castle (as well as the oldest in the city) is St Margaret's Chapel, built by King David I for his mother in 1130. The volcanic rock provides a great defensive location, with the Esplanade being the only entry route, but yet this is one of the most attacked castles in the world, suffering at least 26 attacks. The worst was the Lang Siege in the 16th century, which destroyed many of the buildings (the Castle is made up of numerous separate buildings inside its walls). It has served as a royal residence, with the Royal Palace and Great Hall, built by King James IV, still remaining. You can even see the room where Mary Queen of Scots gave birth to her son, future King James VI of Scotland and I of England. It also served as a military fort, and there are military museums, and dungeons to visit inside. It is also the location of the Scottish Honours, which are the crown jewels consisting of crown, sword, and sceptre, and the Stone of Destiny, a large lump of sandstone which was used to crown kings of Scotland hundreds of years ago. It was taken by the English king Edward I 1296 and kept in Westminster Abbey, in London, for the next 700 years. A group of Glasgow students stole the Stone back in 1950, smuggling it into Scotland, resulting in the border being closed, and they actually broke it on the way! They had it repaired and left it at Arbroath Abbey; the priest then returned it to London, much to their dismay. It was eventually returned to Edinburgh in 1996, as a gesture of goodwill, and was piped up the Royal Mile in a procession on St Andrew's Day, and placed in the Castle where it remains to this day. And that brings us to the end of the Royal Mile! Well done if you made it the whole way, and hopefully you learned some interesting stories along the way - Edinburgh has so much history, and this post only scratched the surface. 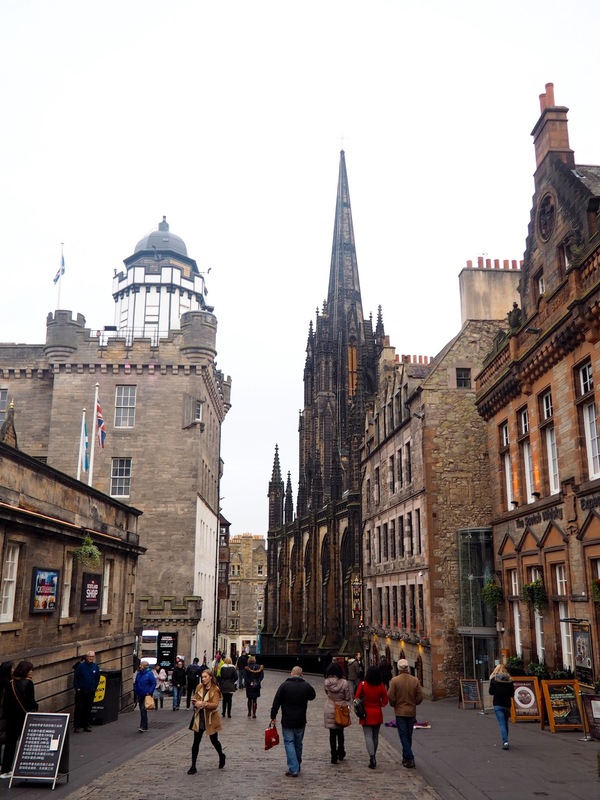 It turned out to be a longer post than intended as well, but hopefully will be the first of many posts I'd like to write about Edinburgh, and maybe more of Scotland too!